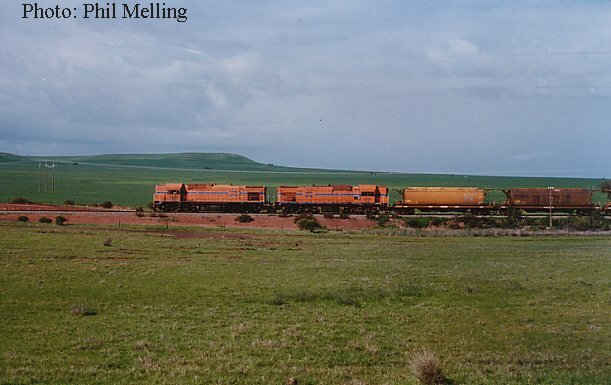 The Narngulu to Mullewa Railway is approximately 100km long, in 2002 only grain trains used this section, in 2004 they will share the tracks with iron ore trains. There are no CBH facilities on the line, except at Mullewa. This means over 3 million tonnes will be potentially hauled over the line in a year. A crossing loop exists at Northern Gully, the loop sits at the top of the climb from Narngulu and is 40km from Narngulu. 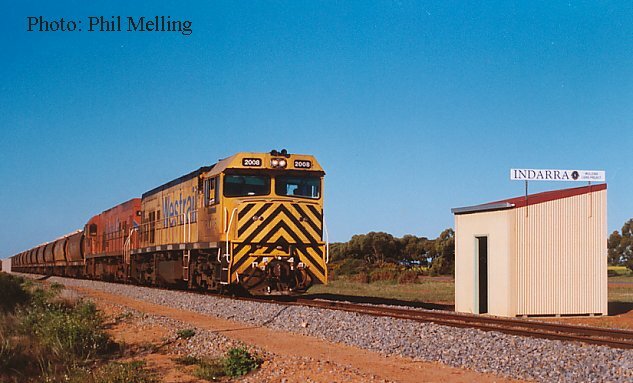 A train order non-crossing station also exists at Indarra (between Northern Gully and Mullewa). This allows Control to break the section up further to allow flexibility in train operations, although trains cannot cross there. 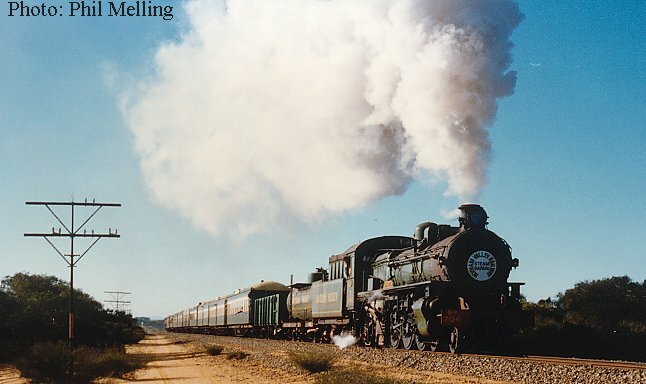 PM706 hauls an Hotham Valley Tourist Railway train towards Geraldton along the Mullewa line, the train originated in Perth via the now closed McLevie to Maya section of the Avon to Mullewa Railway. Photo taken 25 August 1996. The section of line through Bringo is quite scenic in winter, coupled with steep grades and curves. 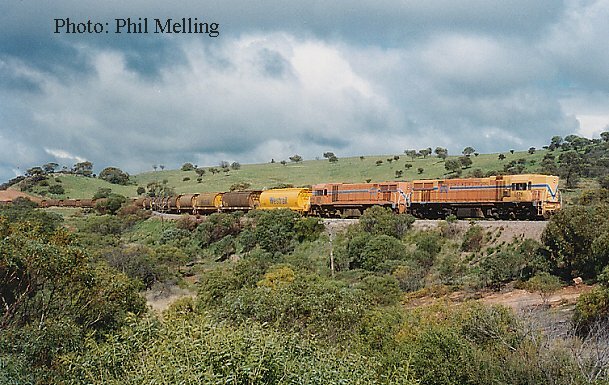 Here we see DA1576/DA1575 descending with a grain train to Geraldton on 12 August 1995. The largest structure on the line is the Eradu Bridge 50km from Geraldton. 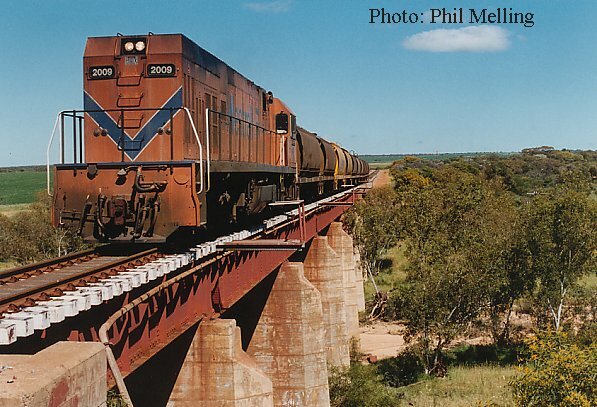 Here we see P2009 crossing the bridge with an empty grain train heading towards Mullewa on 10 September 1995. 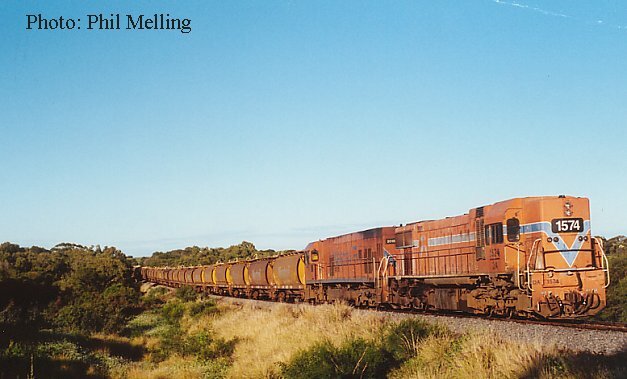 AB1536/AA1515 haul an empty grain towards Mullewa through Moonyoonooka on 4 August 1996. 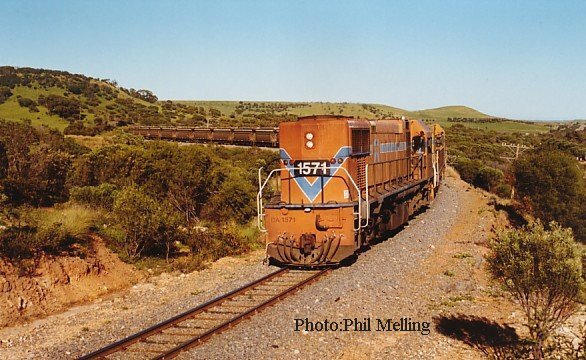 P2008/P2017 pass the reconstruction of an "out of" shed at Indarra with a loaded grain for Geraldton on 9 September 2000. The shed was built by the Mullewa Lions Club. The Geraldton to Mullewa line has a number of scenic locations, here DA1571+DA1572 climb through Bringo heading to Mullewa then head south to Bowgarda. Photo taken 1 August 1999. Since then DA1571 is painted in the Westrail yellow colour scheme, DA1572 is painted in ARG colours.